We are the factory authorized service dealer for DV Systems (formerly Devair Inc. – formerly DeVilbiss) for Central Ontario. All used compressors are thoroughly tested and repaired before being offered for sale. Pressure lubricated, 4 cylinder, 2 stage compressor pump. There is no match for the quality, performance, and reliability of the DeVilbiss 445 Pump. It will last years at 80% duty cycle. Pump was rebuilt up to factory specifications. Which means it has 20,000hrs of life. 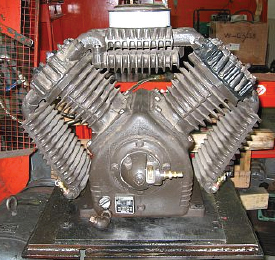 The pump is made with cast iron cylinders, heads and crankcase. Pressure lubricated bearings. Balanced crankshaft. Individually serviceable spring and disc valves. This pump was built to last and be serviced. This unit is being sold by Centrair Air Systems & Supplies 705-722-5747. We have been providing quality repairs and maintenance for over 17 years in Central Ontario. Our reputation for fair pricing on new and used air compressors and supplies is well known. We match our recomendations for each customer based on their unique needs. If we recommend it, its the best solution at the best price.